In this paper, I reply to Ward Churchillâ€™s contention that, in struggles against tyrannical regimes and oppressive political systems, nonviolent resistance is ineffectual without either corresponding violence or the threat of violence. My response attempts to show why nonviolent resistance is an effective method in its own right, and can be superior to violent alternatives in terms of accomplishing both short and long term objectives. Finally, I address a peculiar aspect of Mr. Churchillâ€™s position that, while insulating it from falsifiability, simultaneously limits both its credibility and usefulness. Submitted by Shannon Pritting (pritting@oswego.edu) on 2008-11-03. Made available in DSpace on 2008-11-03T19:43:09Z (GMT). 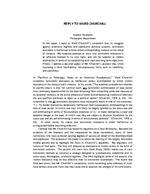 REPLY TO WARD CHURCHILL Andrew Feldheim Philosophy Department In this paper, I reply to Ward Churchills contention that, in struggles against tyrannical regimes and oppressive political systems, nonviolent resistance is ineffectual without either corresponding violence or the threat of violence. My response attempts to show why nonviolent resistance is an effective method in its own right, and can be superior to violent alternatives in terms of accomplishing both short and long term objectives. Finally, I address a peculiar aspect of Mr. Churchills position that, while insulating it from falsifiability, simultaneously limits both its credibility and usefulness. In Pacifism as Pathology: Notes on an American Psuedopraxis, Ward Churchill condemns nonviolent resistance as ineffectual unless accompanied by either violent resistance or the threat of such violence. In his words, The essential contradiction inherent to pacifist praxis is th at, for survival itself, any nonviolent confrontation of state power must ultimately depend either on the state refraining from unleashing some real measure of its potential violence, or the active presence of some counterbalancing violence of precisely the sort pacifism professes to reject as a political option (Churchill, 1998, p. 44). His contention is that all nonviolent resistance must necessarily result in one of two outcomes: .) To render themselves perpetually ineff ectual (and consequently unthreatening) in the face of state power. In which case they will likely be largely ignored by the status quo and self-eliminating in terms of revolutionary potenti al; or 2.) to make themselves a clear and apparent danger to the state, in which case they are subject to physical liquidation by the status quo and are self-eliminati ng in terms of revolutionary po tential (Churchill, 1998, p. 44). In other words, he claims that nonviol ent resistance is either ineffective or extinguished before becoming effective. I believe that Mr. Churchill has base d his argument on a false dichotomy. Between the extremes of the impotent and the vanquished lie those movements, many of them nonviolent, who have achieved varying degrees of success on behalf of the disenfranchised and oppressed. The purpose of this paper is to prove the viability of this largely nonviolent middle ground and to highlight the flaws in Churchills argument. My argument will consist of four parts. The first will propose an alternative to violent action in the form of nonviolent coercion. The second will show how Gene Sharp (2002) makes use of such nonviolent methods to construct a strategy desi gned to systematically undermine and, in some cases, disintegrate, tyrannical regimes. The third highlights some of the reasons why violent resistance may be less effective than its nonviolent counterpart. The fourth and final part shows that Mr. Churchills contentions, while containing some elements of truth, have serious structural flaws that may cause one to question the strength of his conclusions. A. Feldheim 154 have more or less import in accordance with the specific situation. There are cases, both historical and theoretical, for which violent action seems the only logical alternative. The extermination of the European Jews during Wo rld War II seems like such an instance. One important difference between this example and the oppression of Indians by the English, or African-Americans by the United States, is th at, in the case of the Nazis, it was not an instance of the same type of repression. They did not wish to subjugate or exploit the Jews; they simply wished to kill them. Fortunately, however, the Nazi exampl e is the exception rather than the rule. Most cases of oppression stem from a wish to subjugate a population in order to profit unfairly from their labors, or to usurp their property. To give Mr. Churchill his due, even in cases such as these, there may be factors, specific to particular situations, which call for violent resistance or a mixture of violent and nonviol ent resistance. Each situation must be evaluated on its own merits. My contention is not that there is no truth in Churchills position. Rather, it is his use of absolutes his insistence that violence or the threat of violence is always necessary, that demands a refutation. Churchill presents his contention, that violence or the threat of violence is a necessary constituent of successful resistan ce to tyranny, in a way that makes it unfalsifiable. This, however, does not add to its merit. To potential counterexamples, Churchill simply relies on the presence of groups which may be potentially violent. The very nature of tyranny, however, naturally encourages feelings of resentment and hostility on the part of the oppressed. If one looked hard enough, he could always find some indication of potential violence, even if not overt. Churchills argum ent will, in this sense, always be true, but gives us no more actual information than a tautology. Also, since Churchill supposes a causal relationship between violent resistance a nd the defeat of dictatorships, and this construct is placed within an historical c ontext, we can never know what would have happened if there had been no violence or the threat of violence, but only nonviolent resistance. While it may not be possible to prove Churchills argument unsound, its very nature makes it of limited utility. VI. References Churchill, W. (1998). Pacifism as Pathology: Notes on an American Psuedopraxis [sic] Pacifism as Pathology Winnipeg, Manitoba: Arbeiter Ring. 29-69. Deats, R. (n.d.). The Global Spread of Active Nonviolence. From the Authors website. http://deatspeace.tripod.com/global1.html King, M. L. (1963). Pilgrimage to Nonviolence. Christian Century Foundation, 1960. Rpt. In Instead of Violence: Writings by the Great Advocates of Peace and Nonviolence Throughout History Ed Arthur and Lila Weinberg. New York: Grossman. 69-75. Ruddick, S. (1989). Notes Toward a Feminist Peace Politics. Maternal Thinking New York: Ballantine. Sharp, G. (2002). From Dictatorship to Democracy: A Conceptual Framework For Liberation Boston: Albert Einstein Institution. Schock, K. (2005). Unarmed Insurrections: People Power Movements in Nondemocracies. Minneapolis, MN: University of Minnesota Press.